Could Your Dirty Shower Head Really Cause Lung Infections? When you step into the shower, you’re expecting to come out all clean and shiny. But as a study shows, your shower-head may be dumping risky bacteria all over you – bacteria that can even cause lung infections. You (hopefully) keep your toilet and sink clean, but be honest – you don’t pay all that much attention to your shower-head, do you? You might want to give it a good scrub, though, because researchers found that in some places within the U.S. and Europe, germs known as mycobacteria are found in abundance in shower-heads. These are also the same places where bacterial lung infections are most common. In the U.S., that includes parts of Southern California, Florida, and New York. 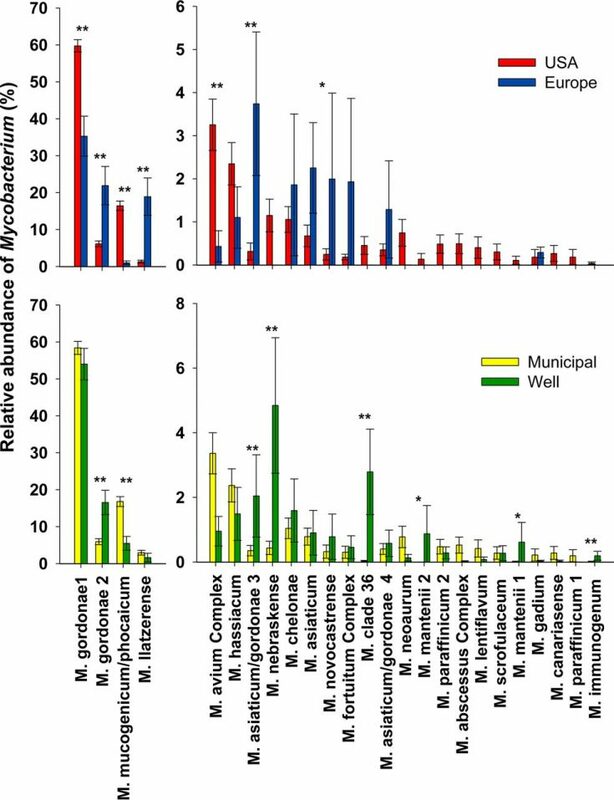 Abundances of the top 25 mycobacterial clades detected across homes in the United States on well versus municipal water and across homes in the United States versus Europe. “We live in a world covered in bacteria, and the bacteria in our showerheads follow some interesting geographic trends, and can be altered by our water source and water chemistry. Shower-heads and water distribution systems are teeming with bacteria, and while most of them are harmless, some of them can cause lung infections. The presence of mycobacteria doesn’t mean you’ll get sick or that you’re more likely to develop an infection, but if you’re already susceptible to infections, you should get to cleaning. Though the study couldn’t even say with any certainty whether a person with a lung infection got it from their shower or not, that doesn’t mean it’s not important to make the public aware of their presence. For the study, Gebert and his colleagues analyzed shower-heads from homes across the U.S. and Europe. They found tons of bacteria, though the types they detected varied by location and by the chemistry of the water and its source. One surprising finding was that homes whose water was treated with chlorine actually had higher levels of certain germs. There are about 200 species of mycobacteria that occur naturally in the environment. Most non-tuberculous strains of the bacteria are harmless. Some, however, can cause nontuberculous lung infections, which are an increasing threat to public health. You don’t have to worry about a massive outbreak of lung infections, but you may be more vulnerable if you are run down or have a compromised immune system or a chronic condition, according to Siegel. He recommends cleaning your shower-head every week or 2 with a disinfectant that contains ammonia, but you can easily replace the harsh chemical with natural cleaners, such as hydrogen peroxide, baking soda, and others.